In recent years I have been experimenting with new ways of presenting my work. I have always loved books, particularly their tactile nature, and the fact that they can be produced utilising a wide range of materials and finishes. Handmade photobooks provide an extremely creative approach to presenting series of work. They allow artistic control of every aspect; from design, sequencing, printing and production. Due to the time and dedication involved in making a book, only a very limited number can be produced. I love the fact that no two books will be the same, the hand of the artist evident in each carefully-crafted volume. – ‘Qalupalik’ is on permanent display at the Ilulissat Art Museum, Western Greenland and The Last Supper Gallery, London. Artist Edition of 5, Handmade book incorporating 20 photographs and unique encaustic piece. February 2019. Hand-crafted, hardback book, 220mm x 220mm, cloth-covered in ‘stone’ grey and titled in pigment ink. Artist edition of 5. Made to order, Signed and numbered. Hand-stitched Swiss binding, exposed spine. 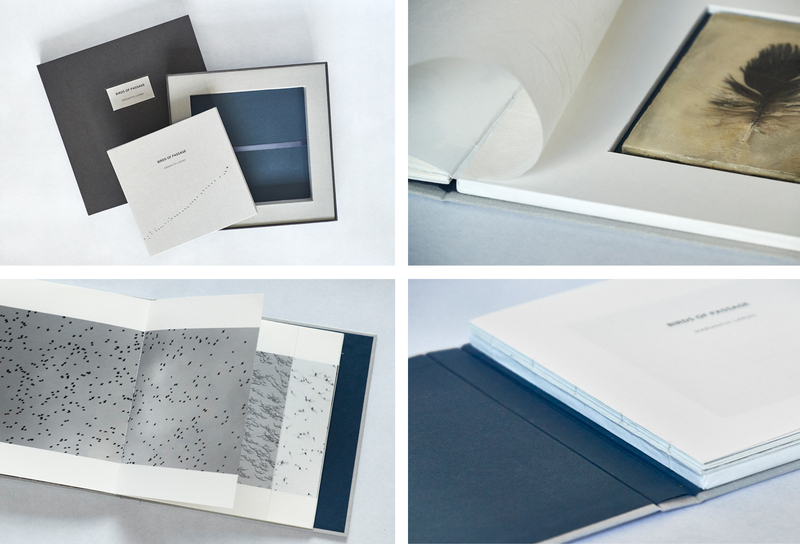 Internal pages are archival pigment prints on Japanese Awagami papers (70gsm and 125gsm). Interleaved page of Japanese Unryu tissue. Murano endpapers. The rear of the book incorporates an encaustic piece, mounted inside a specially-constructed 10mm deep frame. Covered with Japanese papers and attached to the book block. Housed in a handcrafted presentation box, designed and custom-made by the artist. 320mm x 320mm. Murano papers and bookcloth in twine grey. Hand-crafted, hardback book, 255mm x 220mm. 55 pages, with 26 images and accompanying text. Printed on Japanese Awagami papers with pigment inks. Selected pages printed on Fedrigoni satin. Interleaved with Japanese Unryu Palomino tissue and hand-embellished Murano papers. Khadi Bhutanese endpapers. Housed in a handcrafted presentation box, designed and custom-made by the artist. 270mm x 230mm, using handmade Khadi Bhutan and delicate Unryu Palomino papers from India and Japan. Artist Edition, Handmade Photobook. February 2018. Exhibited in York during the Lensthink Yorkshire photo book festival, April 2018. A copy is on permanent display at the Kunst Museum in Ilulissat, Greenland and can also be seen / purchased at The Last Supper Gallery, London. “In Inuit mythology, the story of the otherworldly Qalupalik is told by Inuit parents to prevent children from wandering too close to the dangerous shorelines. These sea-dwelling creatures with long hair and green skin, hide beneath the surface of the freezing Arctic waters …. Collector’s edition of 30. Signed and numbered. Includes a limited edition print from the Qalupalik series, printed by the artist using archival materials. 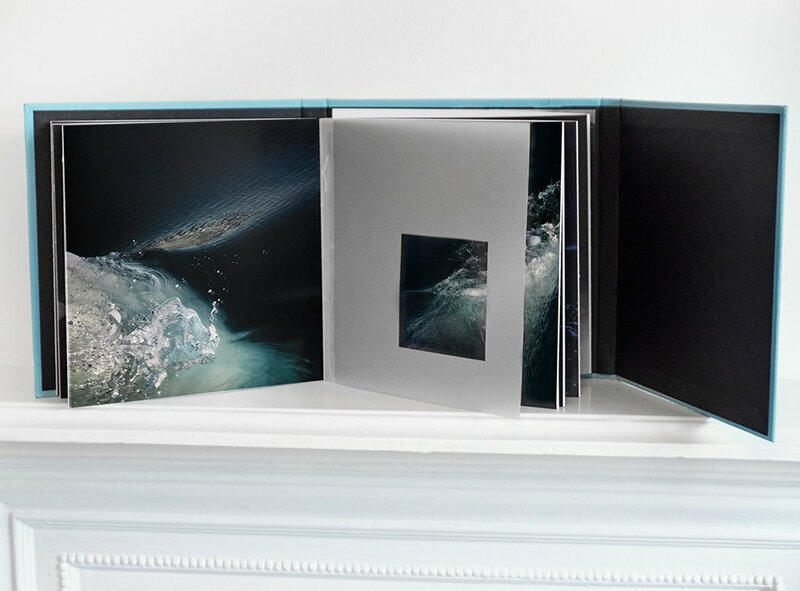 Book is housed in a custom-made acrylic box, designed and assembled by the artist. 8mm frosted acrylic with 5mm clear acrylic sliding lid. Overall book size is 180mm x 180mm. A collection of images from my Shifting Sands series. At the most north-westerly point of the Wirral peninsula, the shoreline is gradually retreating. Strong winds sweep in from across the Irish Sea, shaping the coastal landscape and transforming the beaches into shifting seas of sand. Drum binding, 24 pages, with 12 images and accompanying text. Limited edition of 15 plus 2 Artists Proofs. Signed and numbered. Hand-printed using archival matte fine art papers. Hand-crafted, portfolio-style book, 57 pages, with 32 images and accompanying text. Limited edition of 5. Plus 2 Artists Proofs. Signed and numbered. Overall book size is 260mm x 250m. Selected images have been printed using delicate Japanese Unryu papers with vellum interleaving. Cloth-covered, casebound (hardback) cover, bound with hand-stitching using waxed linen thread.